The discussion below is taken from a thread launched by "Scott Langholff" on the Synth Zone Arranger forum. Music light, has anyone tried one of these? Saw this light today at Waldenbooks. They have the complete package including extra bulbs and ac adopter for about $15.99. Seems very handy, just wondering if its enough light to cover two pages etc. Otherwise, I may just try it as they have a 30-day return policy with receipt. The solution to the age-old problem of using sheet music is to put that sheet music in a notebook computer thereby eliminating the need to carry volumes of sheet music, music stand, light, etc. The notebook computer has a backlit screen, can hold more sheet music than you could carry in a tractor-trailer, weighs less than two pounds, the print is easier to read (go with the 15-inch screen) and now there's a neat, mini-USB light that's available to light up the keys so you can see them in darkened rooms. Two models are available from www.cyberguys.com and the bulb will last 1,000 hours. 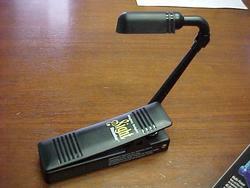 Another model uses a tiny LED light and comes with a clip so it can be attached to the top of the computer's screen, while the other is a gooseneck rig that is flexible and can be positioned exactly where you want it. I'm buying one tonight, and at $11.49 for one, or $8.95 for the other, it's a no barber. The product # is 142 0350. The other, less expensive light is #141 0352. The more expensive light is shown here (available from CyberGuys!). Another problem solved by creative engineering -- Hmmm. Or was that Better Living Through Chemistry? I really love the goose neck lights on my 9000Pro. I have one trained on my music stand and one on the little behringer mixer. That way, when the rest of the house is asleep and the insomnia kicks in, they, and the glow from the monitor screen, are the only lights in the house. I often wonder why they left them off the Tyros? Maybe they will materialize again on the mythical Tyros Pro! 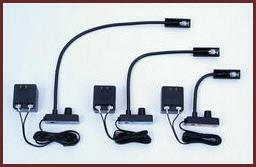 Be careful when using any lights that might use an internal transformer to lower voltage. 60 Hz line HUM can result. You are better off using incandescent lights using standard line voltage. ScottY: Aren't you the one that has the Littlite? I was looking for that thread but couldn't find it. How do you like it? Grandpa Doug: Hello, it's good to hear from you over here on the Yamaha forum. hehehe. I was glad to hear the light works on all brands, because if I get a KN7000 too, it could have gotten quite expensive for two lights.